Schools and colleges need to be able to keep a record of all student incidents to satisfy any criminal investigation or eDiscovery requests. This is a difficult task as the preservation of original data and record lock down of that data, to disposal of that record are near impossible to manage manually as social media message volumes grow exponentially. Schools and college governance can be exposed when it comes to social media records management. SMC4 Observer provides a fully integrated records management capability to control the entire life cycle of each individual inbound and outbound social media communication. SMC4 Observer provides policy based document retention that complies with formal records management standards such as DoD 5015.2, TNA, DOMEA, VERS, ISO 15489, and MoReq. Diagram 1 below illustrates the process that SMC4 Observer uses to manage social media communication records. SMC4 Observer receives the social media message from social networks, classifies the message and depending on the rules setup for a school or college’s records management policy, it will declare it as a record and apply a specific retention period of time, e.g.) 1 year. 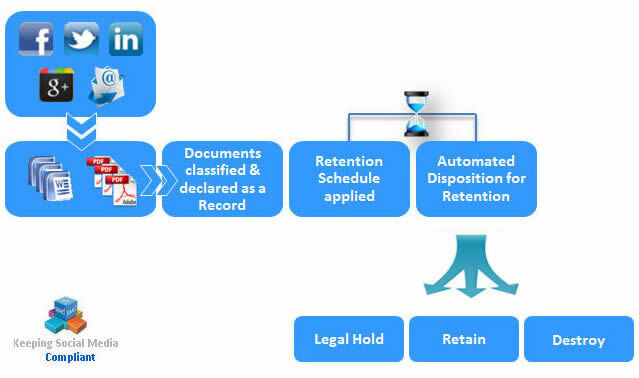 When that period of time expires, SMC4 Observer’s records management tool will enable a school and college to specify how it wishes to dispose of that record, enabling them to notify relevant staff to approve the record disposal, additional retention period or put it on legal hold. Once the records management rules in SMC4 Observer are configured, the records management process is automated, enabling the school and college to focus on providing care, support and education to their students. This integrated approach provides a seamless process to allow for all messages to be archived and retained for 2 years, creating full audit trails. This means that if a person is being bullied or is bullying someone else then the system tracks and shows any previous incidents.